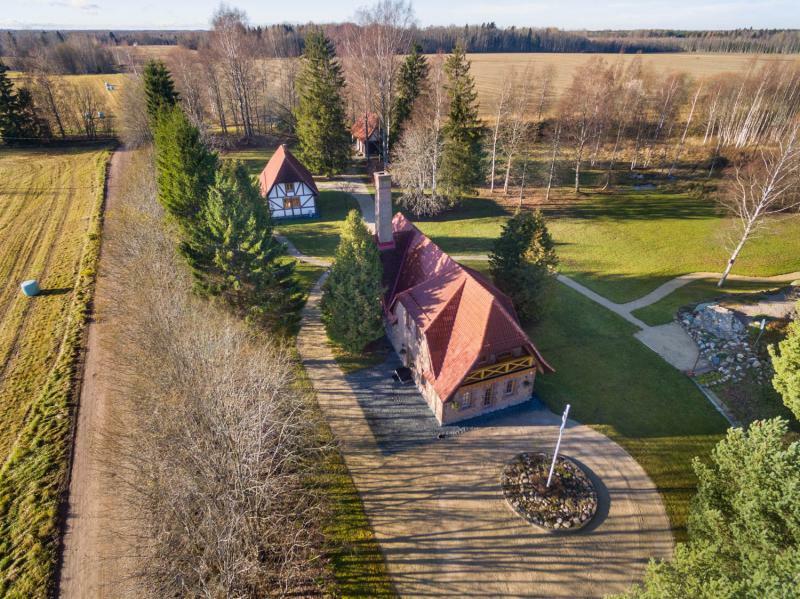 A modern manor house awaits for its proud new owner at the heart of Viljandimaa’s scenic nature. See the VIDEO below! The compound consists of three different buildings located on a private property with plenty of trees. The propertyis excellent as a luxurious private residenceor business location, e.g. accommodation, conference and/or training centre. The 1.9 hectare plot includes the following buildings: residential building, sauna/guesthouse,garage. It is easy to move between the buildings on lightedpathways. The propertyhas flat terrain and is bordered by a dignified park-forest. As there is no ornamental garden, the property is fairly low-maintenance (perfect for using a robotic lawn mower). Beauty is added by an abundant rockery set up next to the future outdoor kitchen.There is a small forested area on the north side of the property, ensuring abundant mushroomsin thefall.The driveway that has a small roundabout for comfortable manoeuvring is well-suited to a dignified residence. The location of a pond has been prepared on the property according to plans. The spruce hedges and trees add value and privacy. The main building was once a distillery that was renovated and expanded in 2012. Today, the main building is a majestic and luxurious villa with all basic amenities (central vacuum cleaner, video surveillance, etc.). The net floor area of the building is 163.5 m2, with an additional27.6 m2 terrace. Fieldstonefrom the old part of the building was preserved during restoration. Later, the stone was cleaned and the joints were filled to give it new life. The extension was built using AAC, insulated with polystyrene foam (two layers) and the exterior was retouched with handmade antique bricks to match theoverall aesthetic. The ceiling level was insulated and historically accuratered burned clay rooftiles were fitted as roofing. 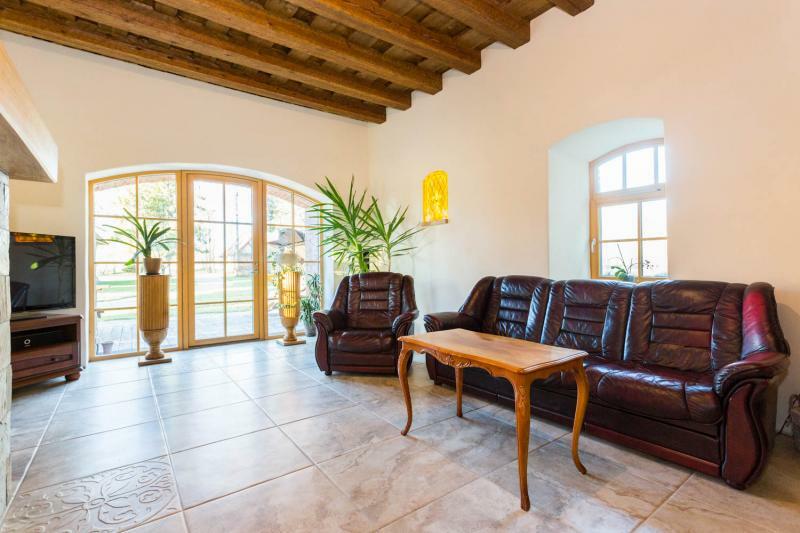 Only high class materials have been used in the interior of the building.The ground floor living room, hallway and kitchen have been tiled; the dining room and walk-in closet have natural solid oak flooring. The first floor hasnatural slate flooring. The walls have mostly been finished with light-coloured structural paint; wallpaper is only used in some of the rooms. Visible fieldstone walls, wooden ceiling beams and recessed stained glass lightingadd a historical touch to the living room. 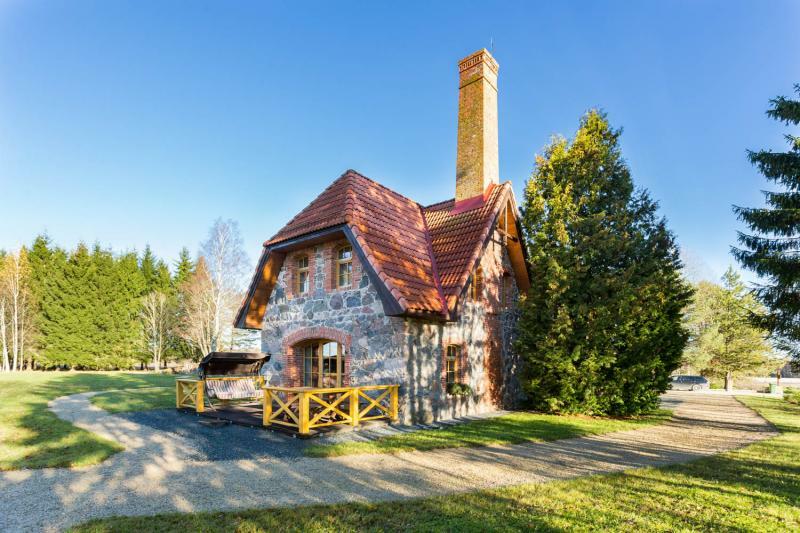 The authentic half-timber sauna house is built on a fieldstone foundation. The walls combine a timber frame with AAC; polystyrene foam has been used for external insulation and structural plaster with half-peg claddingon thefaçade. The house has a reddish brown stone roof. The sauna/guest house serves as a private sauna or a guesthouse. Atall wall protects the sauna from cold wind, allowing you to bask in the sun in early spring and adding some privacy. A wide terrace suitable for a small pool or a hot tub is located in front of the sauna house. There are two separate rooms in the garage building: a large48.1 m2 garage withhigh ceilings and an electrical door, and a 15.4 m2 shed. There is a staircase leading from the garage building to the first floor – this can be developed and made to work in your advantage (e.g. accommodation). Both the main building and the sauna/guesthouse are heated with ageothermal heat pump, which helps lower monthly expenses. The rooms of the main building have piping for floor heating; the hall on the ground floor also boasts a heat-storing fireplace. The main building is equipped with theKomfoventheat recovering forced air ventilation system. The sauna house has heaters both on the ground and first floor; the wash room has floor heating. The buildingscan be equipped with solar energy panels. Water is supplied from a well and sewerage is organised using a drain field. The property also has a rain and storm water drainagesystem. The sauna house has proper ventilation that guarantees the movement of fresh and warm air. For security reasons, all buildings have been equipped with security cameras and systems. 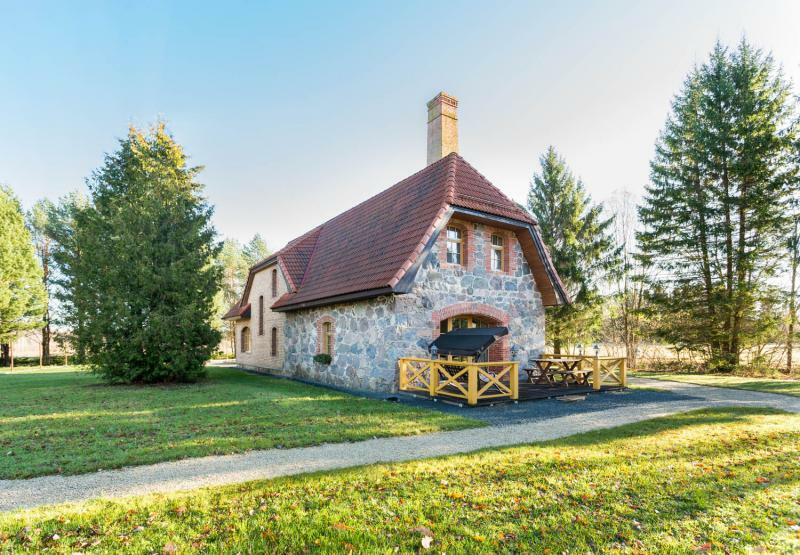 The buildings are only a ten minute drive from the city of Viljandi (15 km) and are accessible viapaved roads. A school bus drivesby the house every morning to take the kids to the nearby Heimtal manor school. Public transportation stops are nearby, guaranteeingrelatively good connection to Viljandi.